Many years ago, arugula was eaten because “it was good for you." Today it is not only a source of iron, but a gourmet item most popular for its almost bitter taste addition to green salads. The flavor has been described as a combination of peanuts and horseradish with a peppery bite - is easy to use too much, so taste as you prepare. Arugula is the Italian name for roquette or rocket, but don’t confuse with a completely different plant called sweet rocket. Arugula is easily grown, planting the seeds directly into the garden early in the spring. Seeds can be planted all season to ensure you of tender, young leaves. Should you let the dainty white flowers come, they are edible too, as long as you haven't sprayed them with chemicals. Arugula will also do well inside in your window box or a small container. The culinary uses of arugula are many - from salads to cooking with other greens. Try a bed of arugula under hot potato salad or toss with linguine, pieces of sun dried tomatoes, and Parmesan Cheese. 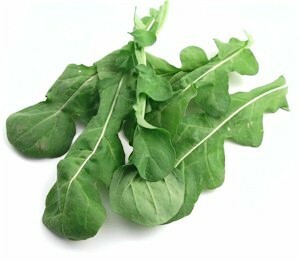 When you compose a salad of arugula, use a mixture of other greens including other herbs such as basil. Toss with the petals of edible flowers and serve with a warm walnut raspberry vinegar. Remember, arugula does not dry or freeze well, so give me a call for the freshest! chicken broth for an excellent soup base. 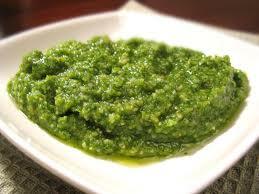 Blend arugula, basil, and garlic to a fine paste — add walnuts,lemon juice and cheese - Blend while slowly adding oil. Makes 1-1/2cup. Fresh herbs have graduated to a new level on the salad bar. Tis the “InThing" to add bowls of chopped herbs to the dry condiment section. Dill, basil, and rosemary are popular. The ordinary selection of salad dressings now include varieties of herbal vinegars such as red and white wine with basil or tarragon. The health conscious-weight conscious customers will appreciate your thoughtfulness. More next time!